The Shell Game Series is a sculptural collection aimed at exploring the complexities of contemporary identity and engaging with the transformation and subversion of materials and forms from within the breadth of figurative sculpture’s history. 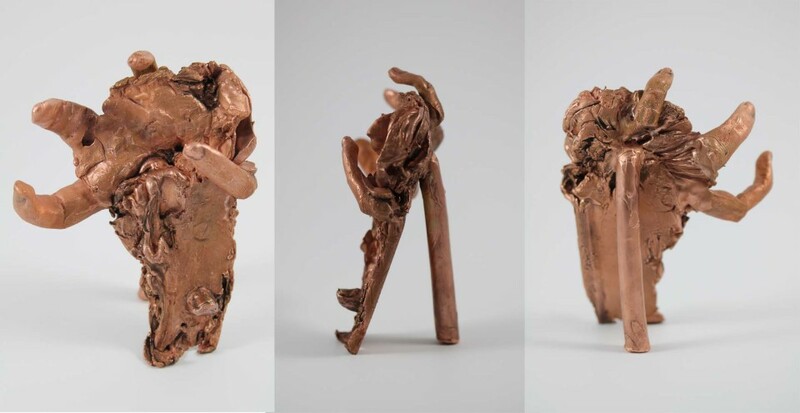 Through the use of intimate scale and unconventional, innovative materials Logan Brody engages with the long held traditions and history of figurative sculpture. Brody uses the electroforming process over microcrystalline wax, zinc casting, and painted resin in her practice. She actively subverts cool, traditionalist notions and explores the boundaries of contemporary sculpture and modes of representation. Logan Brody’s work explores the human body, disruptions of form, expressionistic gestures, corruptible shapes and structures, and formed identities. Combinations of stark geometric forms and organic, painterly inclusions give way to a sort of mutable landscape, where flesh is able to transform into the structures that surround it, and back into active bodies once again. Building upon narratives constructed through the use of illusory spaces and voyeuristic tableaux’s, Brody represents an amalgamation of bodies that question what kind of a represented identity is being crafted. The breakdown of material, structure, and form in her work is directly pitted against the exuberant and dynamic bodies that create her visions of otherness. There is a history of development, transformation, and transmogrification embedded within the work, often times manifesting through a lens of self-examination and scrutiny. Logan Brody (b.1991) is a sculptor and painter based in Chicago, Illinois. She received her undergraduate degree from The School of the Art Institute of Chicago in 2013. Brody focuses on cultivating an interdisciplinary practice, involving metalsmithing, sculpture, and painting. She has exhibited in New York and Chicago, including an open-air sculptural installation at Crab Tree Farm in Lake Bluff, Illinois. She has also been featured in online and print publications such as ArtSlant’s Showcase Series for Painting and Sculpture and the Old Furnace Artist Residency’s Slag Mag. Brody’s work focuses on the integration of abstraction, figuration, and narrative, acting as a vehicle to investigate the complexities of contemporary identities and flesh. The artist actively strives to evolve a shifting feminine aesthetic and is interested in exploring the spectrum of a queer and trangressive experience. These attempts lead to an ever-growing understanding of the boundaries of humanness.